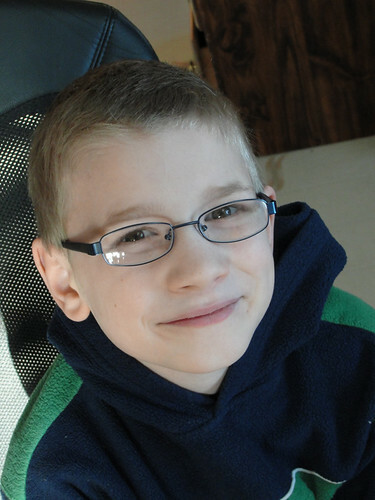 Last week, Jude got glasses. He had been complaining for a while now that his eyes would go blurry, especially in the van. Sure enough, he's far-sighted. I was surprised that he was far-sighted. I mean, his dad's eyes are perfect, which I was really hoping our kids would all be blessed with. However, my dad, my mom, my brother, and myself are all nearsighted--my brother and I both got our glasses around this age. So, I just figured that if his vision was getting blurry, myopia was setting in. The fortunate thing is, the doctor said he may only need the glasses for six months to a year. I'm hoping that's true. I guess we'll see. Unlike when I was a kid, and wearing glasses was something only geeks do, for Jude (and his brothers) this has been the coolest thing ever. As of this month, ALL of Jude's circle of friends wear specs. 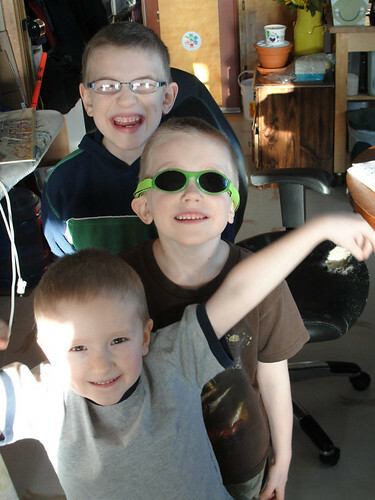 Jude's brothers have been wishing they could, too, so they have been taking turns with our one scratched pair of kids' sunglasses. Jude looks so handsome and grown-up with them on. Sigh. Now, I just need to remind myself to account for the glare in the glasses when I am photographing! 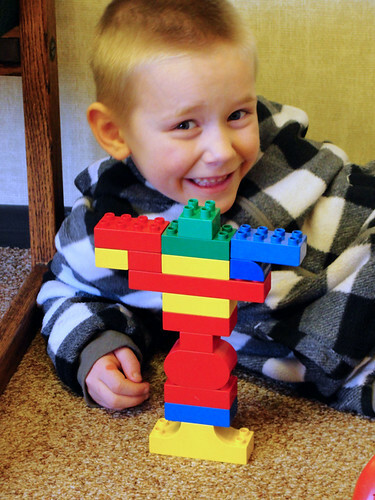 While we were waiting at the optometrist's last week, Noah made a figure out of MegaBloks from the toybox in the lobby. "Look, Mom!" he said. I glanced up from my knitting. "Hey, looks great, Bud! It looks like an inukshuk! Is that what it is?" "Yeah! An inukshuk. It just needs a head!" He grabbed a small square block and eventually got it centred where the head should be. "Inukshuk," he said again, as if he was testing the feel of it rolling off his tongue. I wondered if that was what he had intended to build, or only called it that at my suggestion. "Did you mean to build an inukshuk, or were you building something else?" "Nope, I meant to build an inukshuk," he said. And I believed him. Because only two months ago we were studying the Inuit, and the concept of an inukshuk was so very cool to the kids--seeing as it was part of the logo of the Vancouver 2010 Olympics. Not that we were able to watch the Olympics, as we don't have television reception, but my boys have the Sonic and Mario Wii version thereof. Hey, if it helps my kids remember cool words like "inukshuk", I'm not complaining. My Son may need glasses soon too. I was also hoping he would get my Husband's perfect vision but instead he will probably end up with my horrible vision. Although I had laser surgery 4 years ago, so my vision isn't as horrible anymore LOL. Glasses are a lot cooler now then when we were kids. I had laser surgery three years ago--so. amazing. Yeah, when we were kids, it was the 80's "completely-cover-all-your-distinguishing-features-with-this-ugly-plastic-frame" or nothing. At least it was for my prescription. I'm glad there are options, now. You're right! Jude does look so grown up in his glasses. And tell Noah his inukshuk reminds me of some I saw in a very expensive art gallery in Banff last fall!